Many things are convenient and sensible to purchase online, like commodity items such as pet food, bulk household supplies and other things which do not need your direct sight or touch to make a buying decision. Making good decisions on many other products and services is best accomplished by directly seeing, touching or hearing, none of which can be accomplished online. When you do business with locally-owned stores you have more control than when you purchase online or from big-box stores: you are dealing directly with someone who has a personal stake in your satisfaction and not with companies who answer not to you but to distant organizations and stockholders. When you do business locally you are supporting the local economy, local jobs and local infrastructure with the dollars generated by your purchase, both from local business income but also local taxes. If you want to support your community’s roads, schools, utilities, charities and other things which come directly from local businesses, shop locally. There are some less obvious but important benefits to shopping with local businesses. The people helping you live in your community whether they own or work for the business, and are more familiar with many variables which influence your satisfaction. These people have a personal stake in your and their community as well as your satisfaction with your purchase. Shopping with locally-owned businesses can also be an antidote to our impersonal, screen-driven work lives. Visit and shop with people who actually live in your city and enjoy an actual chat or smile for a refreshing emotional boost. Local businesses work hard to be competitive with online and big-box outlets, and they are usually not too different on identical items. When you see large price differences between local and online or national businesses, double-check to make sure you are actually looking at identical products, which is much easier if you can see, touch, taste or hear what you’re thinking about. Many manufacturers produce similar but not identical products solely for promotional sales in big-box or online retailers. Those great-looking speakers or screens may not be what you thought you saw on your monitor online. Our senses should tell us that if we are purchasing something we will experience and use personally we should enjoy it first hand. 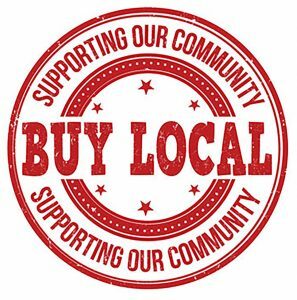 There is no substitute for buying from local businesses who can help and listen to you directly, take care of you individually and support the community both they and you live in.